Adding new inventory to WebManager is as simple as entering a VIN. But if you’re also DeskManager user, you can also choose to sync your DeskManager inventory to WebManager. 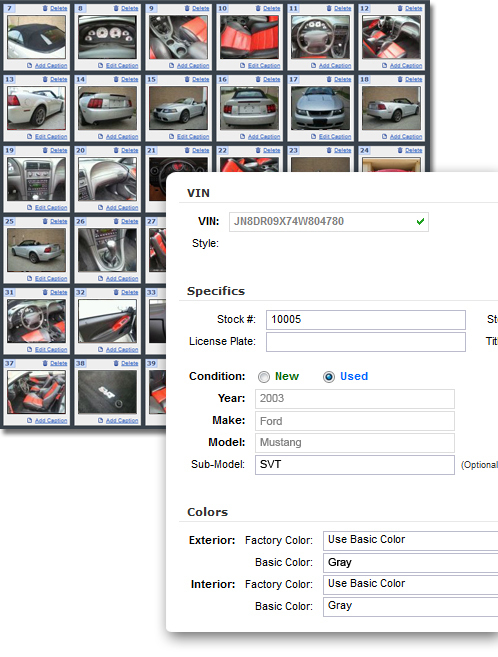 When a VIN is entered, WebManager will decode it and reveal any important vehicle details provided by the manufacturer. When you choose to upload vehicles directly from DeskManager, your vehicles can be sent as-is, or make use of WebManager’s VIN decoder. Once the vehicle is in the system, you can update it with more details such as mileage, color and service history. Adding photos couldn’t be easier, thanks to WebManager’s visual photo uploader. Select and upload up to 100 photos per vehicle from your computer and rotate, caption and rearrange them to give your visitors a detailed tour of your inventory. You can even create slideshows with professional-grade transitions. Don’t have a desktop dealer management package? WebManager can also perform useful functions like printing vehicle checklists, window stickers (in four different design schemes) and buyer’s guides.